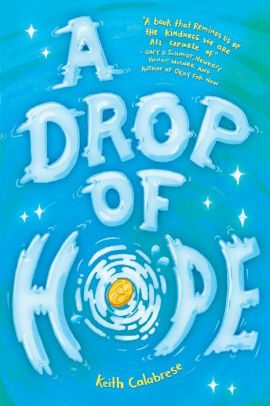 Destiny moves in mysterious ways in A Drop of Hope, a fun and engrossing read for middle grades. Calabrese. Scholastic, 2019, 305 pages. This story starts with a wish and ends in a crime. The wish isn’t granted, and the crime is never punished. Life is like that sometimes, but that isn’t always a bad thing . . . Earnest Wilmette, the only child of a wealthy family, has a promise to his late grandfather to fulfill. Ryan Hardy is feeling his father’s pessimism over lost jobs and a country going down the toilet. Lizzie MacComber is at an awkward stage of development, too much at the mercy of an overbearing cousin who wants to “remake” her. A general air of decline hangs over their factory town—until a wish, spoken over an abandoned “wishing well,” is overheard. And one thing leads to another. From three main characters, the story spirals out in a tangle of unintended consequences, improbable coincidences, and chains-of-events as complex as a Rube Goldberg machine. Every character we meet—and we’ll meet a lot of characters—has a role to play in the upward spiral that leaves their Ohio town in a much sunnier spot than when we began. Some of these developments will seem a bit too improbable, but readers will enjoy the witty tone and likable characters. The mysterious connections and consequences don’t appear to have a cause, unless there really is some kind of magic in the wishing well. It takes no leap of imagination give this unseen hand a name–such as Providence. Though church is mentioned once, religion seems to have no place in the scheme of things, but I was reminded of a statement by (I believe) John Piper: “God is never doing just one thing in our lives. He’s doing a million things in a million lives, all at once.” In A Drop of Hope, readers may get a glimpse of how that could work. Worldview/moral value: 4.5Artistic value: 4.5The post A Drop of Hope by Keith Calabrese appeared first on Redeemed Reader.